Risa: Imagine you're on a plane. There's someone next to you. What do you say? こんにちは。りさです. Risa here.Introducing yourself in Japanese is easy. In this lesson, you're going to learn how with Mark and Shunsuke who meet on the plane. Mark's moving to Tokyo. His family is going to join him later in the month. Shunsuke is in the seat when Mark gets on the plane. Let's watch! Mark: Hi! How are you? I'm Mark. Shunsuke: Hi! Nice to meet you, Mark. I’m Kobayashi Shunsuke. Mark: I’m sorry. Your name again, please. Slowly. Shunsuke: That's it. But please call me Shun. Mark: Shun. Nice to meet you. Shunsuke: Nice to meet you, too. Risa: Here are the keywords from the scene. Risa: Here are the key phrases from the scene. Alisha: The first phrase was used by Mark to have the Japanese speaker repeat himself. He said..
Alisha: Now you try it. Now you say Mark's line after Shun speaks. Alisha: The third phrase was used by Mark and Shun at the end of the self-introduction. Do you remember what they said? Alisha: In this situation, meaning, "Nice to meet you." There's no equivalent in English, as the meaning is derived from the context of usage. Alisha: Now you try! Fill in the line for Mark. Alisha: After Mark repeated Shun's name, Shun confirmed that he had the right pronunciation. How did he do that? Alisha: Now it's your turn! Fill in the line for Shun. Risa: Now, the lesson focus. Here's how to introduce yourself. Ready? Alisha: Do you remember how Mark introduced himself in Japanese? Alisha: When Mark introduces himself in Japanese, he starts with a set phrase meaning "Nice to meet you." Alisha: Then he says, "I'm Mark." Alisha: This is a topic-marking particle. It marks "I" as the topic of the sentence. Think of it like the "as for" in the expression "as for me." The next word of the sentence is the character's name, Mark. Alisha: "I - Mark - am." In English, "I'm Mark." Alisha: Now you try! Imagine your name is John. Say I'm John in Japanese. Alisha: Now, imagine your name is あいこ. Say "I'm Aiko" in Japanese. Kaori: Now use your own name. Alisha: There are two things you should know. First, there's a short-cut to giving your name. Alisha: since it's understood you're talking about yourself. Second, Japanese people usually say their full names — or only their family names — when they introduce themselves. Alisha: is a family name. Alisha: is a given name. Alisha: In Japanese the family name comes first, and then the given name. He could also just say the family name instead of both the family name and the given name. Alisha: Imagine your name is John Smith. Introduce yourself in the Japanese style, family name first. Alisha: Now use the shortcut version. Alisha: Next, you'll learn how to tell people to call you by a nickname, just like Shun did in the scene. Alisha: "Please call me Shun." The word for "I" is not mentioned in the Japanese sentence, but if you say this after introducing your name, it makes perfect sense. Alisha: Now you try! Imagine your nickname is "Matt." Say "please call me Matt" in Japanese. Alisha: "Please call me Matt." Now, imagine your nickname is アイ, say "Please call me Ai" in Japanese. Risa: Now, it's time to practice your new ability. Alisha: It's your first day in Japan and you're meeting your new neighbor. Ready? Here we go. Alisha: What's the first thing you say to someone you've just met? Alisha: How do you tell someone your name? Alisha: How do you tell someone your nickname? Alisha: What's the last thing you say to someone you've just met? Alisha: Great job! You've just introduced yourself in Japanese. You will follow the same pattern many times, so be sure to practice it. Hajimemashite, listeners! Tell us why you're studying Japanese! It's nice to meet you too! I hope to see you often at JapanesePod101.com! Watashi wa Shanteru desu. Demo, Dii to yonde kudasai. 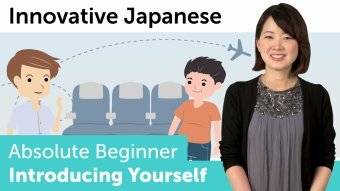 I'm planning to move again back to Japan and this is just what I need to get my Japanese to where it's needed to be, thank you for this lovely website! Japanese is such a beautiful and cute language 😄 And the culture, music, traditions, etc... One day I really want to go to Japan and explore it! These 3 phrases can be used when you met person for the first time and say "Nice to meet you" but よろしく＆よろしくお願いします can be used in another situation. We hope to see you often at JapanesePod101.com!